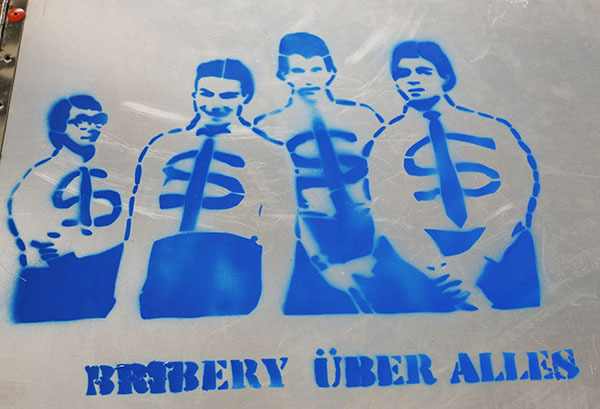 When a team gives a generous tribute to the all-wise and scrupulously fair justices of the 24 Hours of LeMons Supreme Court, they receive a hand-made commemorative stencil sprayed onto their race car. We feel that this is better than the judicial leniency they were hoping to get, of course, and all right-thinking racers (who know what’s good for them) agree with this sentiment. 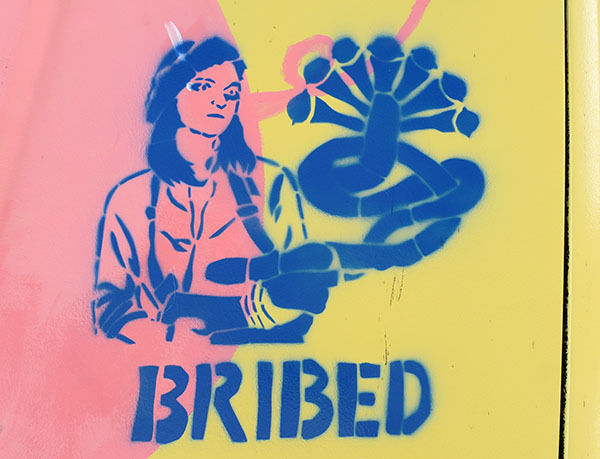 The 2016 LeMons season saw 18 new BRIBED stencils, so let’s look at the full set. 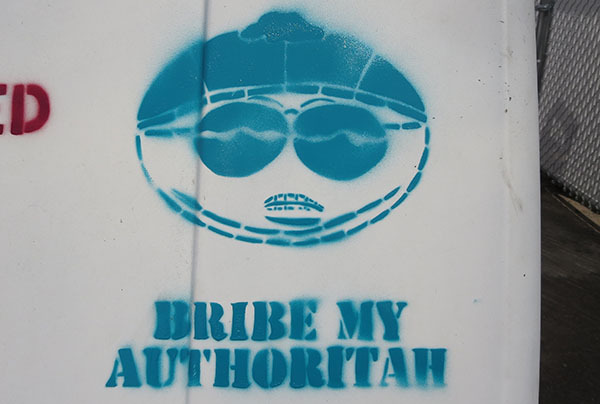 If you’d like to brush up on your BRIBED stencil history, which began at the first South Carolina race in 2008, here are the links: 2015 stencils, 2014 stencils, 2013 stencils, 2012 stencils, and 2008-2011 stencils. 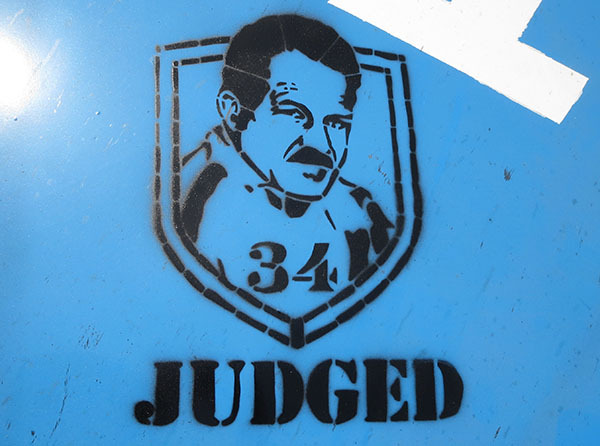 The first race of the 2016 LeMons season took place at Barber Motorsports Park in Birmingham, Alabama, and Judge Eric Rood created this stencil with a haircutting-themed play on words. Around the time of the Sears Pointless race, I was starting the endless build of a junkyard-parts boombox shaped like one of the killer robots from the 1980 arcade game, Berzerk. Since a Berzerk robot shape is so easy to cut out with an X-Acto the artistic merits of the Berzerk robot are so obvious, this became the Sears Pointless BRIBED stencil. 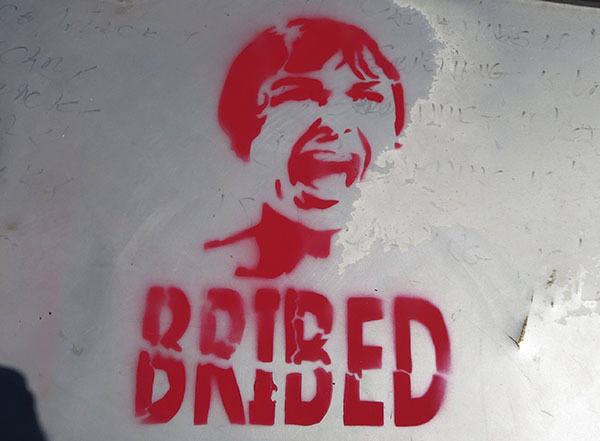 Since Sheriff Joe’s Posse was so hard to represent in a spray-paint stencil, I opted for the screaming face of Janet Leigh in the Phoenix-set 1960 film Psycho when we traveled to Inde Motorsports Ranch. 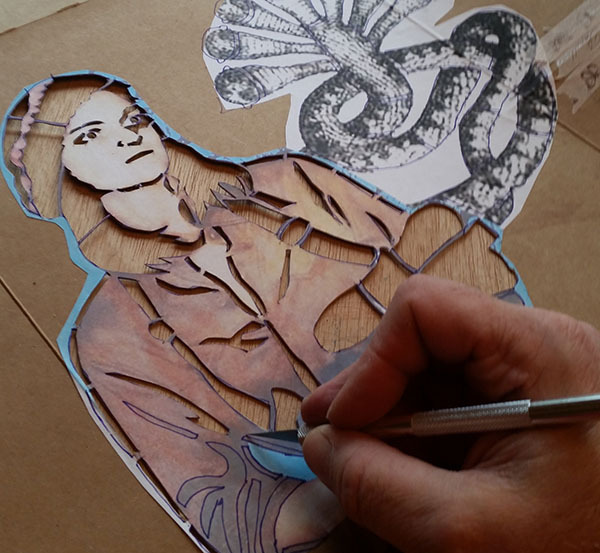 For the April Gingerman race, Michigan native Iggy Pop seemed like the correct choice for the stencil’s image, so that’s what I did for that race. Wendell Scott loved racing so much that he competed in NASCAR during the 1950s and 1960s, when NASCAR’s overlords frowned on black racers (to put it mildly). I used his image on the stencil for the Southern Discomfort race in South Carolina. 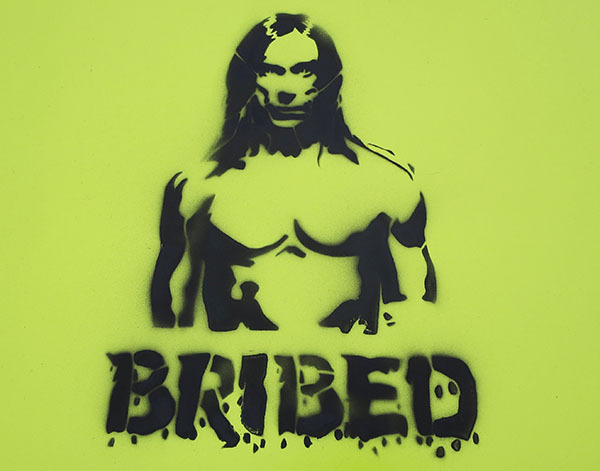 The text reads JUDGED instead of BRIBED, because no amount of bribery would have made Scott’s racing career any easier. The Dead Kennedys symbolize all that is good about Northern California, and so I used this image for the spring Thunderhill race. Now we must listen to Jerry Brown’s most hated song, and hope that someday a LeMons team will race a 1974 Plymouth Satellite sedan in honor of the Suede Denim Secret Police. 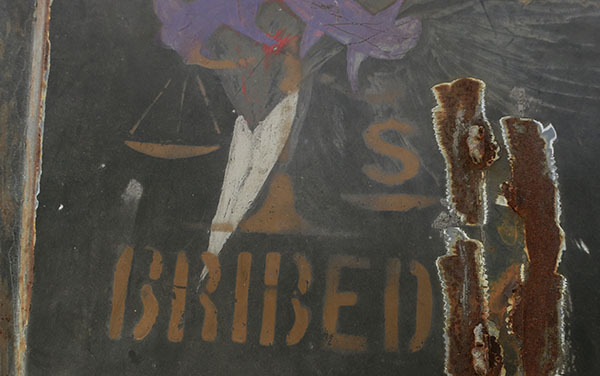 I had used up most of the easily-cut-in-a-stencil Colorado icons for the stencils of previous B.F.E. GP races (Subaru, cannabis, beer, Blucifer), and so Colorado’s Cartman became the stencil at the 2017 B.F.E. 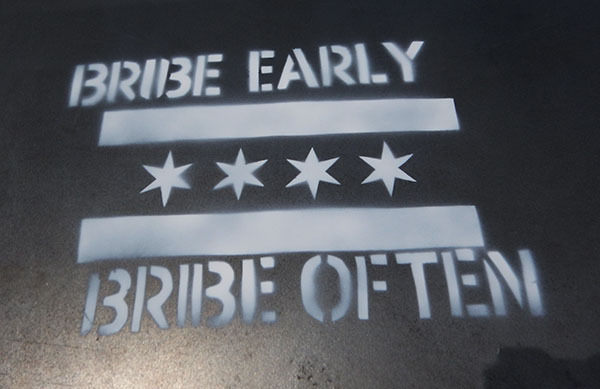 Judge Eric acknowledged Chicago’s important role in American politics, with this stencil for the Autobahn race. 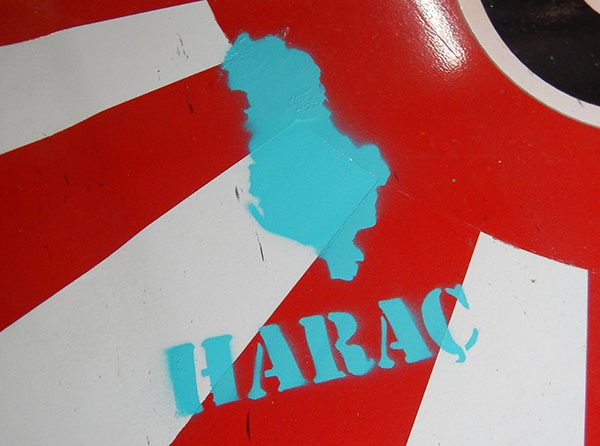 San Francisco Bay Area icon and fashion legend, Patricia Hearst, was the subject for my stencil at the summer Thunderhill race. The seven-headed snake of the SLA was modified to have seven lemon heads. 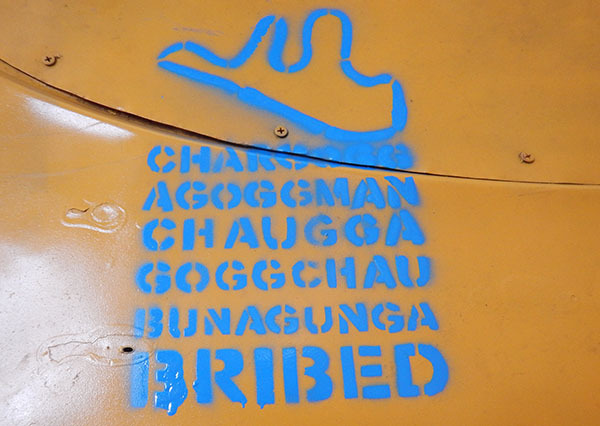 For the GP du Lac Chargoggagoggmanchauggagoggchaubunagungamaugg race in Connecticut, held near the unpronounceable 13-syllable lake, Judge Rich von Sneidern wore out many X-Acto blades cutting out this stencil with the lake’s full name. 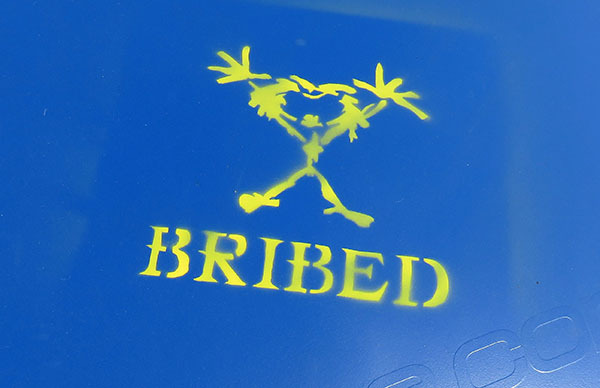 All the way across the country, in the state that was home to Pearl Jam, Judge Steve McDaniel cut out this Stickman stencil for the Pacific Northworst race. 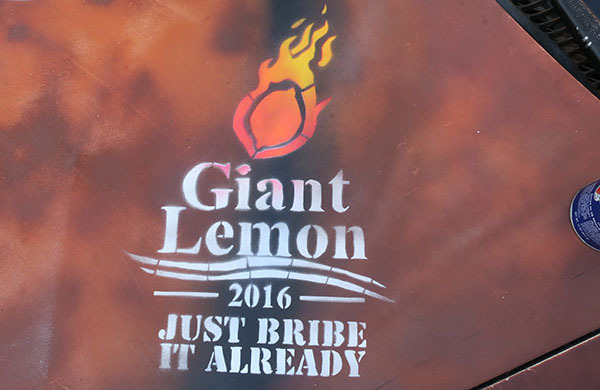 The 2016 presidential election was a miserable affair that made the Chinese Communist Party’s philosophy look like an attractive alternative to American democracy, and so the LeMons South Fall race, held in September, got this Giant Meteor 2016-inspired stencil. 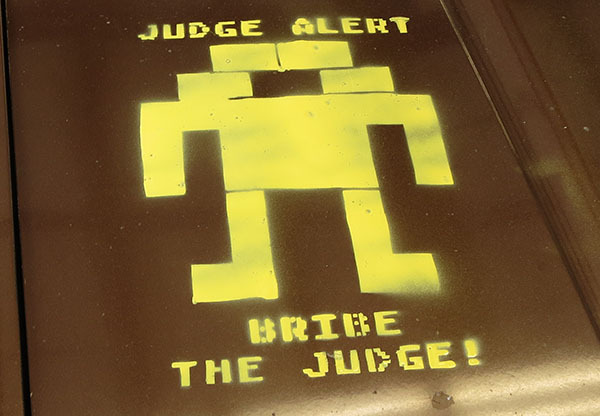 The spiritual kinship between LeMons racers and the Hitchhiker’s Guide books led Judge Eric to create this Infinite Improbability Bribed stencil for Button Turrible race. 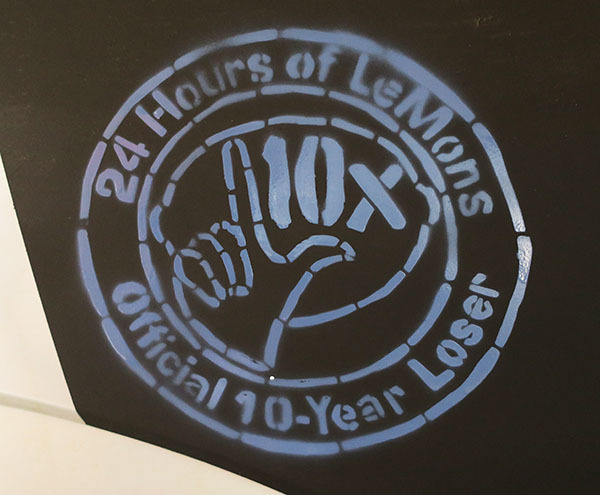 The tenth anniversary of the very first LeMons race fell in October of 2016, which made the 10X LOSER patch seem like the right design for the Decade of Disappointment race in Michigan. The LeMons-endorsed presidential candidate in 2016, Vermin Love Supreme, agreed to serve as the Grand Marshal at the Halloween Hooptiefest. 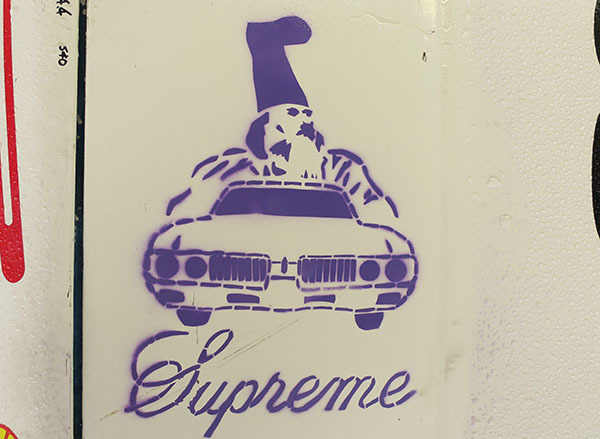 Naturally, a Vermin/Cutlass Supreme stencil seemed fitting for the occasion. 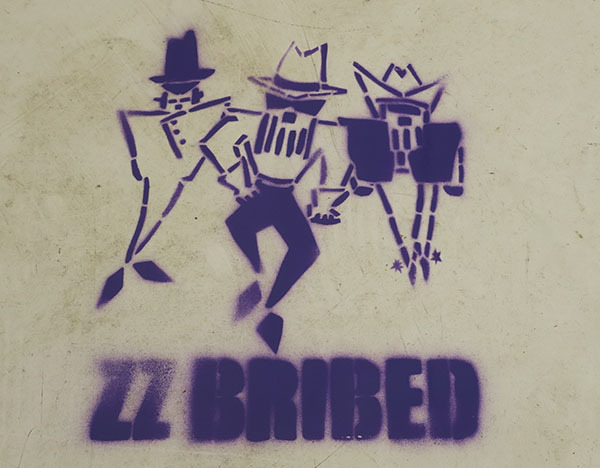 ZZ Top started out in Houston, which made a ZZ Top-themed stencil appropriate for the 2016 MSR Houston race. The 1994 album, Antenna is the easiest-to-stencil best ZZ Top album of all time, so that’s the artwork that inspired this stencil. 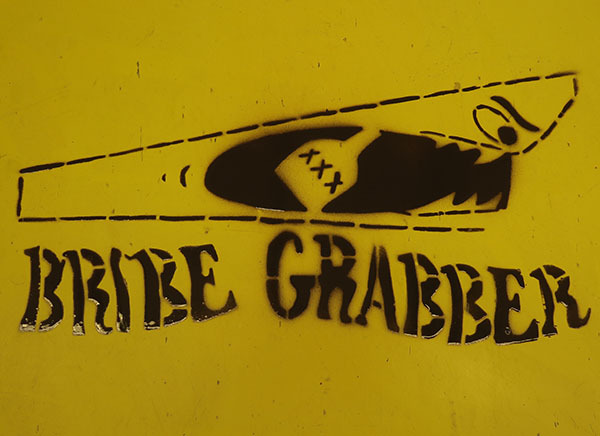 The Air Grabber hood scoop, used on Plymouth Road Runners of 1969 and 1970, is a piece of hardware that every LeMons team should recreate on their hoopties (preferably about five times larger than the original Air Grabber, and with teeth that drip fake blood under full throttle). 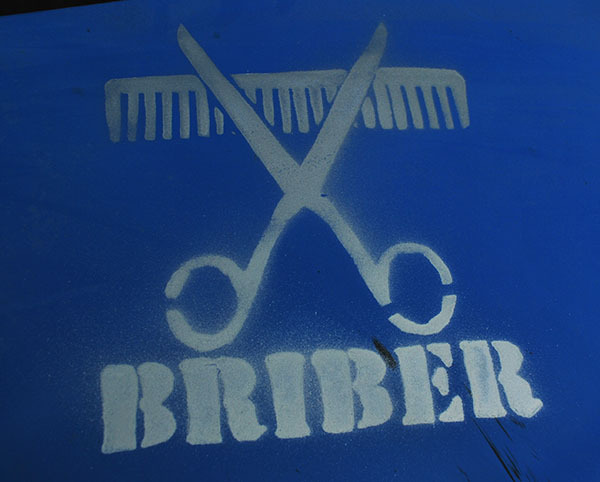 To serve as inspiration for this goal, I made this BRIBE GRABBER stencil for the Sears Point season-ender.